This basic turning project recycles interesting little jars and bottles that normally would be discarded, making them into one-of-a-kind custom gift items. It is also a great use for all those little scrap pieces of contrasting wood that seem to accumulate, but you just can’t throw away. I have made many of these beautiful wooden lidded jars; they are a big hit and are often used more as a decorative item than as a functional jar. We have been known to eat some very strange kinds of jams, pickles, relishes, and who knows what else just to get that specially shaped little vessel (see Fig. 1). Transforming uniquely shaped containers by adding wooden lids is not a new idea by any means. Years ago, a variation of this sort of lidded container project was presented by the well-known woodturner Ernie Conover, who has written many articles (see Woodturning Issue 17, 68  Woodturning Design December 2013 Trash to Treasures Woodturning Design Project by James Duxbury Wooden-Topped Jars November 1993). 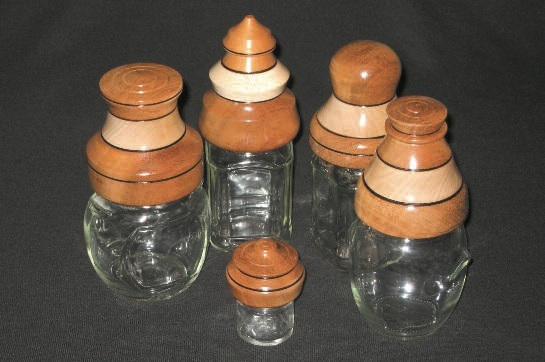 And in the previous issue of Woodturning Design (#45), Scott Roberts explained how to cap ordinary plastic water bottles with wooden tops made from scrap. Hummingbirds have become a real summertime attraction around our house. We began with a small, single-tube feeder of the sugary fluid and have now progressed to a larger, four-hole model. It seems that the bigger the feeder, the more birds appear. They love it. However, ants love the sweet, sugary liquid too, and in no time, find a way to get up the support pole and down into the feeder. The ants don’t eat much, but they crawl all over the feeder, getting right into the feeding tubes where they drown by the hundreds, contaminating the liquid and plugging the tubes. Greasing a short section of the supporting pole works well to deter the ants, but the grease dries out in a few weeks and becomes a real mess after a few applications. Over the years, I have seen a few wishing well-style ant barriers turned out of wood, but never paid too much attention to them. Most are filled with cooking oil and hang between the support pole and the feeder, creating a moat of oil that the ants can’t get through. There are two problems with this system: First, wood that is outdoors does not hold up well no matter what the coating is; and second, over time, the oil soaks out through the thin wall of the wooden moat. Also, both of these conditions are exaggerated when the feeder is hung out in full sun, as is often the case. Analyzing the problem, the design is good, but the material failed. Here is where we can utilize the concept of “going green” with recycled plastics to solve both of these problems.